Mr. Mock is a member of the firm’s Intellectual Property section. His practice includes preparation and prosecution of U.S., foreign, and international patent applications as well as patent and trademark opinions and licensing. 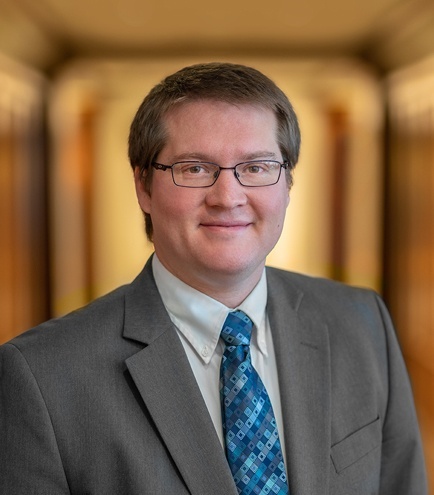 While in Law School, Casey worked as a summer associate at IP Boutique firms in Utah, as well as North and South Carolina where he gained experience in both intellectual property litigation and preparing patents for submission to the U.S. Patent and Trademark Office. Casey also worked in the BYU Law School’s Law and Entrepreneurship clinic, advising Utah start-up companies on IP strategies and patent portfolio development as well as in BYU’s Copyright Licensing office. Prior to attending law school, Casey worked as a Nuclear Plant Engineer for Knolls Atomic Power Laboratory in New York where he worked as an officer instructor, operator, and project engineer at a reactor prototype supporting the U.S. Navy nuclear fleet. He completed a highly specialized program lasting two years that included intensive training in electrical engineering, material science, electronics and control systems, chemistry, and nuclear physics. He was certified as an Engineering Officer of the Watch and Engineering Duty Officer.